Parties are booked for 2 hour time slots. Your party comes with a 1 hour naturalist-led program and access to the birthday party room for the full 2 hour reservation. Want to customize the party? We can build a party around your child's interests- from fairy houses to troll forts! Get on a bug’s level and see what you can find! Your party will spend time turning over logs, digging under leaves, and looking in the bushes for the smallest inhabitants of the Preserve. Following the hunt, your party will have the opportunity to make a bug hotel to take home! For birthdays in the warmer months, what could be better than splashing in a creek with your friends? Try your hand at scooping up fish in a net, look for animal prints in the sand, build a beaver dam or make a leaf boat! Test out your survival skills by building your own woodland shelter. Would you build a hut, a structure against a tree, or a whole village in the woods? Explore the woods and creek to see if you can find clues of what animals have been visiting! Your party will get to build your own animal homes in the woods and watch some of the videos we’ve captured on our wildlife cameras of animals passing through the Preserve. Does your child have a green thumb? Come learn about what it takes to grow a garden! Make a wildflower bouquet, visit with worms, get your hands in the dirt, and make a newspaper pot to start your own garden at home. Learn about our busy and beautiful insect friends! We will try to catch butterflies, follow a bee from flower to flower, see if we can spot other pollinators and make wildflower bouquets to take home. Did you know that beavers live in the wetlands of the Preserve? Touch a real beaver pelt, build a beaver dam, and look for beaver chewed sticks! These creatures are primarily nocturnal, but there is still so much we can learn about them during the day. Does your child love art and animals? Come enjoy an art party full of friends drawing and painting the critters that live at the Preserve! Award-winning naturalist artist, Christy Knight, will guide your party on a nature walk and through the artistic process, creating original art to take home. Come explore the skies looking for our feathered friends at Blue Heron. There are so many ways we can learn about birds and have fun at the same time! 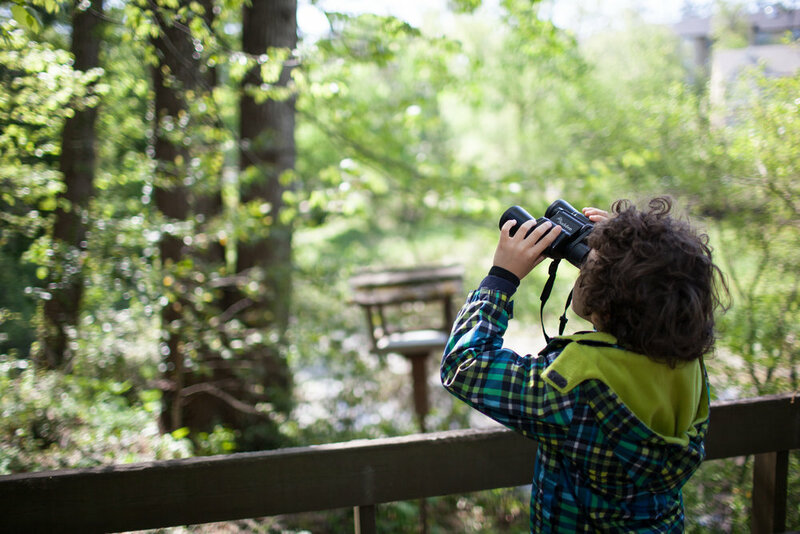 Look through binoculars, find bird nests, and make a bird feeder to take home. We partner with The Amphibian Foundation for a personal experience with animal friends! There is an additional fee of $75 for critter parties. Your party will get to spend time with frogs, lizards, turtles, and maybe even a snake. Your child will get to go outside for some wilderness exploration with our naturalist for games and salamander hunts. What is the cost for a birthday party? Birthday parties are $200. Flock (and above) members get a 10% discount. Critter birthday parties are an additional $75. There will be an additional charge of $7.00 per child in attendance beyond the 15 child guest limit. We can accommodate up to 24 children. Adults and children who are younger than 3 and do not participate in the party are free. You must make a $50.00 deposit to reserve your time slot. The deposit will go towards your final total, which is due the day of your party. You may pay with cash, check, or credit card (Visa, Discover, or Mastercard). What does Blue Heron provide? Blue Heron provides you with a 2 hour room rental, tables, chairs, a fridge and kitchenette area. We can also provide a cooler, but you must provide the ice. You supply the tablecloths, plates, napkins, cups, utensils, and decorations. We have about 12 tables that are approximately 2 ft wide and 4 ft long. You may arrange them in any way you want. You may decorate the party room as you wish but please avoid using balloons for the sake of Mama Earth! We do have back-up napkins, utensils, cups, and even candles and a lighter in case you forget something. When can I arrive to set-up for the party? You can arrive 30 minutes early to set-up for your party. Your Blue Heron Naturalist will be there to help you access the party room and assist with minor parts of the set-up. They will also help greet your guests as they arrive and give them directions about how the party will proceed. When will my birthday party program start/end? Your naturalist will determine when to start the party program. Usually, the program begins about 15 minutes after your scheduled party start time. This allows guests time to arrive and settle in. Your naturalist will have coloring activities and allow supervised access to our Children's Garden while you wait for your guests to arrive. Once most guests have arrived, your Naturalist will start the party. We ask that one adult join the naturalist and the children on their outdoor explorations- of course, all adults are invited! Your program with the naturalist will last about 1 hour. Then, your naturalist will bring the children back to the building to help them wash their hands and get ready for food/present opening/ etc. The last 45 minutes of the party are for you to use as you wish. We finished our cake and ice cream but still have 20 minutes of party time, what do we do? Your naturalist will remain on-site during your part of the birthday party, and can open our Children's Garden for children to play in if they need something to do. We ask that you please have an adult from your party supervise the play in the Children's Garden. There will also be books and drawing supplies in our party room loft, and children are welcome to read or draw in this area. What do I need to do for clean-up? Please ensure all your trash is in a trash bag and that our floor is swept. Your naturalist will take care of getting the trash out, and can wipe down the tables. We give you 30 minutes after the scheduled end of the party to clean-up. We ask that you help get your guests to leave the building during this time too, so our naturalist can close the building or get ready for the next birthday party. what should I tell my guests to set expectations? Make sure your guests know that your party will be happening outside at a Nature Preserve- rain or shine! Children should wear clothes that can get dirty and wet. A change of shoes/socks or an entire change of clothes is suggested. We also highly encourage sunscreen and bug spray, which guests should apply before arriving. If it is just sprinkling or drizzling, we still go outside and enjoy the rain. There are amazing things to be found in the woods in the rain! However, if the weather is unsafe for outdoor exploration, our naturalist will set up alternative activities inside. Your child will have a great time no matter what! Can parents drop-off their children for the party or do they have to stay? We let you decide if you want a drop-off party or if you prefer parents to stay. We do ask that one adult be present during the party program to help our naturalist with group management. We also ask that an adult help our naturalist supervise the Children's Garden before and after the party program if your party will be using it. No. We are a City of Atlanta Park and we do not currently have the permit to allow alcohol on the property. BLUE HERON FOCUSES ON NATURE-BASED AND CHILD-LED EDUCATION ROOTED IN THE REGGIO PHILOSOPHY.